On Friday I attended a event featuring rock legend Ozzy Osbourne. 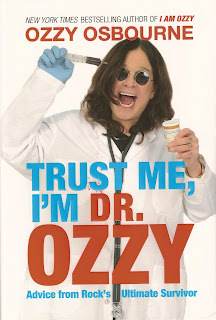 Ozzy was scheduled to sign copies of his new book "Trust Me, I'm Dr. Ozzy" at Barnes & Noble in Riverside. I was a little hesitant on attending because my thing is sports autographs. I don't care much for music or celebrity autographs. At the same time Ozzy is a legend and to be signing autographs in my area made this event a must. I arrived at Barnes & Noble about 7:30 in the morning and noticed hundreds of fans already in line. I was told many fans had camped out overnight. Numbered wristbands were then distributed at 9:00 a.m. by employees. Once you were given a wristband you were pretty much guaranteed an autograph. After getting a wristband fans were told to come back later in the day for the book signing which would start at 7:00 p.m. I arrived about 5:30 in the afternoon and this was the crowd outside of the store. Shortly before 7 p.m. fans were let inside the store to make line. This was the scene inside with the first couple of hundred fans. Fans were anxious for Ozzy to show up. A no flash photography rule was in place. Here is Ozzy signing copies of his book. This was the closest fans were allowed to take pictures. Ozzy talking with a fan. This was a different set up that I'm used to. Fans were required to hand the book to a handler. That handler would then hand it to a security guard who would give it to another handler who would then hand the book to Ozzy. Ozzy would sign the book then slide it over to the security guard on his right who would then hand the signed book back to the fan. Confusing? Watch the video below. People in line? Over 400 people. Free signing? No, purchase of the book was necessary. Price of the book? $23.26 with tax. Books per person? Ozzy would sign up to 3 books per person. Outside items? No outside memorabilia was allowed. Which Barnes & Noble location? Riverside. Thanks to Ozzy Osbourne and Barnes & Noble for this well planned and organized event.